Click here to try Anno Domini 2019 for 21 days for FREE !! 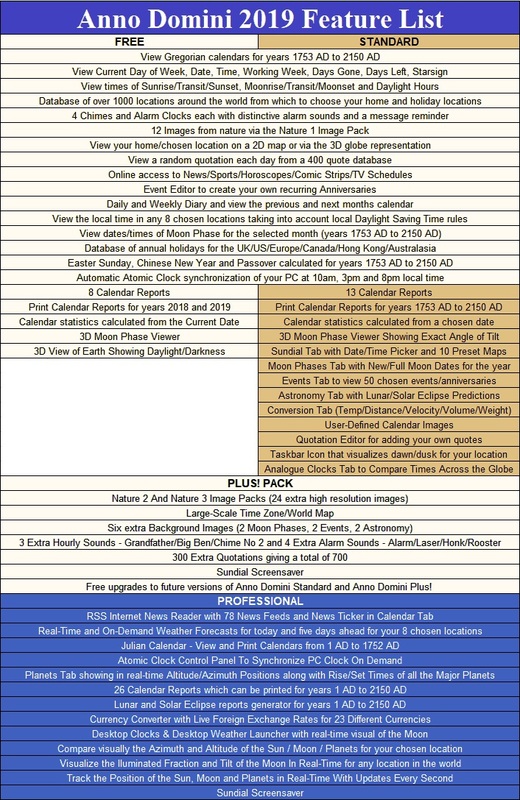 Hundreds of calendar features to try. Plus! and Pro versions have even more features! Enabled multi-monitor support for the Sundial Screensaver and also added an option to display the current date. The RSS news reader now uses a different font to ensure all characters are displayed correctly. New entries have been added to the Weather menu to give access to temperature maps for the UK, USA, Canada and Mexico. Entries also added showing the highest/lowest recorded temperatures in the UK, USA, Canada, Ireland and around the world. Entry also added noting users of impending lightning strikes for locations around the world. New databases added to the Location tab with 10 of the hottest and coldest places on Earth now available. Various DST rules and time zones have been changed and the locations database has now grown to over 1200+ locations. Finally a number of small bugs fixed. Full details can be found on the Revisions section of the Anno Domini website. * Purchase of Anno Domini Standard entitles you to one free upgrade on next major release. ** Purchase of the Plus! Pack entitles you to free lifetime updates to Anno Domini Standard and Anno Domini Plus!